The Mediation Server in Microsoft Lync Server 2013 is a service that connects your Lync users and Lync Servers to the PSTN. This server role is required for any connections to the PSTN or a legacy PBX infrastructure. When organizations are planning to deploy Enterprise Voice or Dial-In Conferencing, a Mediation Server must be deployed and connected to a next-hop PBX or PSTN. There are various ways to connect to the PSTN, including a PSTN Gateway, an IP-PBX, as Session Border Controller (SBC), or directly to a SIP trunk. The Mediation Server is a back-to-back user agent (B2BUA). A B2BUA operates between both endpoints in a SIP call to facilitate communications. When routing calls to the PSTN, users are directed to a Mediation Server. The Mediation Server receives a PSTN call request directly from Lync clients and divides the call into two signaling and media sessions. The Mediation Server then initiates a call through the PSTN device it is connected to. During PSTN calls, all SIP signaling routes through the Mediation Server. Additionally, media can also route through the Mediation Server if Media Bypass has been disabled. Figure 1 outlines a sample call flow between a Lync client and the PSTN with the Mediation Server managing all signaling during the call. Figure 1. Mediation Server signaling example. All SIP signaling will traverse the Lync Mediation Server, but media can travel directly from Lync users and the PSTN gateway or IP-PBX. Lync Server 2010 introduced the Media Bypass feature, which allows Lync users to send media directly to supported gateways or PBXs using the G.711 media codec. This feature remains in Lync Server 2013 and provides improved call quality, and much larger capacity to the Mediation Server role. Figure 2 provides two examples of how media could flow in Lync Server 2013: with Media Bypass disabled and with it enabled. Figure 2. Mediation Server media flow example. Media Bypass becomes more attractive in branch site scenarios. 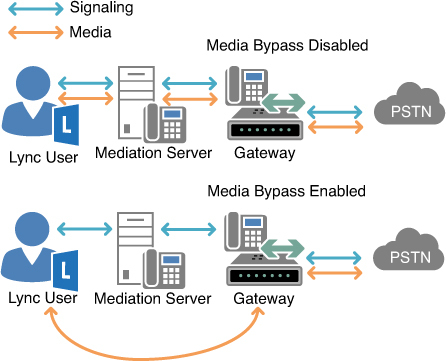 When a branch site is connected to a centralized Lync infrastructure and that branch site has its own PSTN connectivity, Media Bypass can allow Lync users in the branch site to communicate directly with the local media gateway, greatly reducing bandwidth requirements over the WAN. The Mediation Server can require heavy processing for media traversal and transcoding in some scenarios. Often, small organizations can collocate the Mediation Server role; however, many larger organizations will require dedicated Mediation Server roles for capacity purposes. Media Bypass also has a major impact on the number of calls a Mediation Server can support.